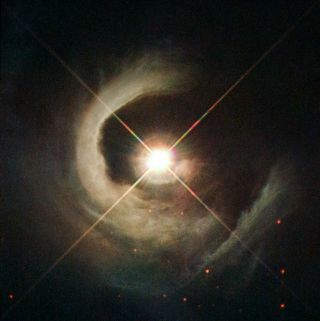 The young star V1331 Cyg, as imaged by the Hubble Space Telescope, is a T Tauri star: a young stellar object beginning to contract into a main-sequence star like the sun. New research suggests why such stars release fewer X-rays than expected during their tumultuous transformations. Lab experiments simulating the formation of new stars may have revealed why young stars give off much less X-ray radiation than expected, a new study finds. The young stars might keep the emissions trapped as a byproduct of their ravenous feeding process. Much remains uncertain about the way young stars behave in the early stages of their formation, scientists in the new study said. "We cannot see much about the details of what happens on the stars, because the resolution of our telescopes is not good enough," study senior author Julien Fuchs, a plasma physicist at École Polytechnique in Paris, told Space.com. "When matter accretes onto a star, it has a huge amount of kinetic energy from the gravitational pull of the star, and when this matter stops when it hits the star, that kinetic energy is converted to heat, leading to superhot spots one would expect to emit a hell of a lot of X-rays," Fuchs said. To help solve this mystery, Fuchs and his colleagues mimicked star formation in the laboratory. They fired a narrow stream of laser-heated plasma at a solid target in the presence of a strong magnetic field. To mimic accretion onto real stars, the scientists fired 1-millimeter-wide streams of plasma at speeds of about 1.6 million mph (2.7 million km/h) at targets made of either plastic or Teflon. Because the researchers could not imitate the vast areas over which such accretion takes place, they compensated by using incredibly powerful magnetic fields of 20 teslas in strength.When these plasma streams hit targets, "we saw this dense shell or cocoon form around the surface where the plasma was landing," Fuchs said. The researchers suggested that this dense shell could absorb X-rays from stars. "This is a very good explanation for the lack of X-rays that are seen," Fuchs said. The scientists detailed their findings online Nov. 1 in the journal Science Advances.